50 Lions pokie slot machine game - Play pokies online for fun! Try and play 50 Lions slot machine game on your desktop or mobile device for fun. No download, practice play mode. 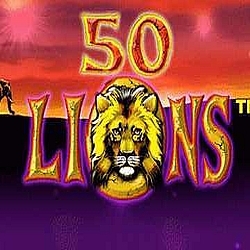 50 Lions is a 5 reel slot machine, with 50 pay-lines which started life as a slot machine in a land-based casino. It is now available online and it includes stacked wilds and free spins. 50 Lions slot is being played in land based casinos since around 2003 and now it is also available to play online but no Aussie players for real money only our free version below. Developed by Aristocrat the 50 Lions slot has an African theme and offers great chances of winning. The slot game is packed with wild animals, native plants and colourful images. If you love fun slots, then you will surely enjoy this one. The bonus features and amazing game play will keep you entertained for as long as you want. Have a free burl on 50 Lions below and get them lions running up some big wins! This online video pokies game is an innovative creation of Aristocrat and since it has an African theme, you can expect attractive graphics and excellent sound effects. With this game, you can embark on an adventure trip into the jungle and enjoy the fun ride with the native animals. The user interface has a black and bright orange colour theme which depicts sunset. The symbols used in the game are also relevant to the theme. The high value symbols include two tribal women, the Serengeti landscape, a giraffe, a lion and a zebra. The lower value symbols are 10, J, Q, K and Ace from the standard card deck. 50 Lions has 50 paylines and betting starts at $0.50. When you play this slots game online, you have a range of betting options to choose from. The coin values starts at $0.01 and goes up to $4. It is only possible to bet one coin per payline. The maximum bet can be placed at $200. There are a number of bonus rounds in 50 Lions that will not disappoint you. The first one is the free spins bonus feature and the other one is the free games bonus round. There is a wild symbol in the game which is represented by the Lion symbol. Landing this symbol anywhere on the reels improves your chances of winning. The symbol can appear randomly during gameplay. However, when it appears during the free spins feature, it appears as stacked wild symbols which further enhanced your odds of winning. The scatter symbol is represented by the wild flower symbol and when 3 of them appear on the 1st, 2nd and 3rd reels, the player is awarded with 10 free spins. To improve your chances of winning bigger payouts, there is an additional wild symbol in the game which is represented by the wild diamond symbol. The symbol also becomes a stacked wild symbol and gives bigger wins. When the bonus round is in progress, it is possible to trigger the free spins bonus feature again by landing 3 wild flower symbols on the reels. Does this game rock or not? With this game, players have good chances of winning. 50 Lions slots has a gamble feature as well which makes this online video slot even more exciting. Although the maximum jackpot is not that high when compared to most other online slots, the bonus features, gameplay, graphics and sound effects add to the thrill and enjoyment of the game. Overall, it is a nice game and if you have the patience to wait, you can get some big prizes too.